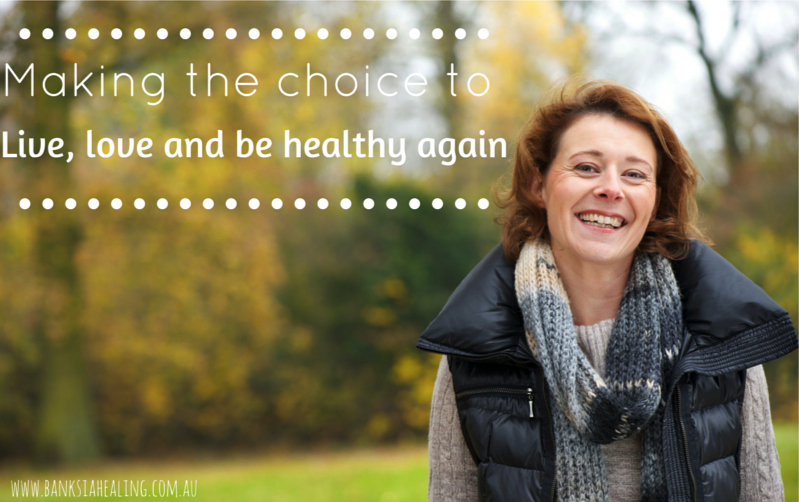 Making the choice to live, love and be healthy again. I’d like to share a story with you. A story of a lady who made choices to live and love life. This could be any of you. At 50 years of age this woman had two teenage children, worked full-time, had been married and had been through a bitter, blaming divorce. She had survived breast cancer and endured a mastectomy, radium and had come out the other side. This woman, who could be any of us, had had enough. She had soldiered on through all the bad times with support from family and friends but now she was left alone with her children, juggling life and work. Trying to maintain a balance. Trying to become healthy again. How does this woman let go of the past and have her happy future she always thought she would have when she was a teenager? That happily ever after? Finally this very same lady took the first step in her healing journey. She made a decision to live, love and be healthy again and a phone call and appointment was made at Banksia in search of a natural solution for her health and for her life. It was at this point where her pressure valve finally released. As she sat in my office, tears streamed down her cheeks. Tears she didn’t even realise were within her until that point in time. Tears of relief that she could move forward. Tears for her loss and finally tears of joy. Up until this time she had protected herself with a stiff armour, fearful to reveal any chinks and she soldiered on. Regardless of whether this covering was for her children, herself or for others but now for this woman, it was time, her chance to gradually and slowly remove her hard shell. A careful process so as not to break her bubble of protection she had created to live and survive to this point. This woman was a survivor and was prepared to do what it takes to be fulfilled and love her life again. To live for her children and grandchildren which are yet to come. This was the start of her natural healing journey the Banksia way. Her first visit at Banksia was to learn what could be done to help her, to live and become healthy again. She had tests of her pH, zinc, AcuGraph, pulse and tongue diagnosis, all completed, along with an acupuncture treatment to kick start her health to balance her. As she went home she was given some alkalising drink, ph balancer and whey powder to get her started on her new road to good health. She has now commenced her 3 month journey of intense healing on her road to recovery. It all started when she made the choice to live, love and be healthy again. Join our FREE women’s E-Health Group to get access to the latest information and health packages to improve your health naturally.